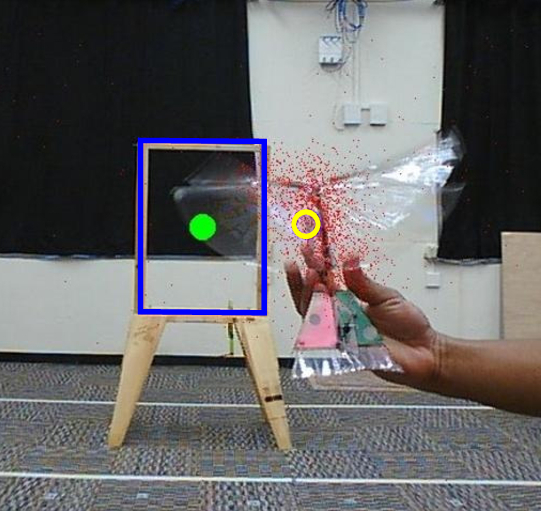 Flapping flight provides the high maneuverability necessary for operation in a partially structured indoor environment. To achieve robust intelligence for tasks such as search and indoor navigation, the maneuverability of the ornithopter will be combined with a learning approach which makes minimal assumptions about the nature of disturbances and obstacles. This approach will develop optimal control policies for single or multiple vehicles. 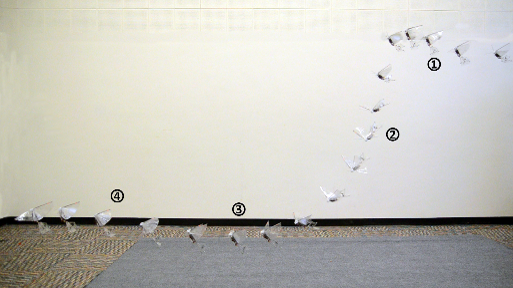 Based on globally optimal distributed reinforcement learning, we propose to develop algorithms for a set of ornithopters to cooperate in sensing and navigation among unmodelled obstacles such as doors and walls. Our research will be verified with full three dimensional dynamic simulation, a multi-tethered laboratory test-bed, as well as with actual indoor flying ornithopters. 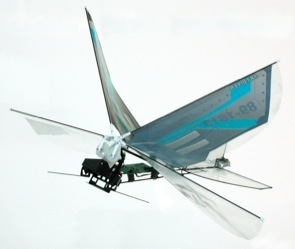 We demonstrate autonomous flight control of 13 gram ornithopter capable of flying toward a target without any remote assistance. 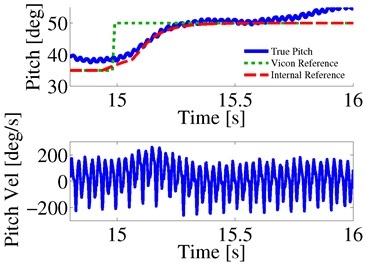 For this demonstration, we have developed a closed-loop attitude regulator for the ornithopter using onboard sensing and computational resources. Movie IROS 2011. Image Proc 2.2 design revision by Stan Baek. 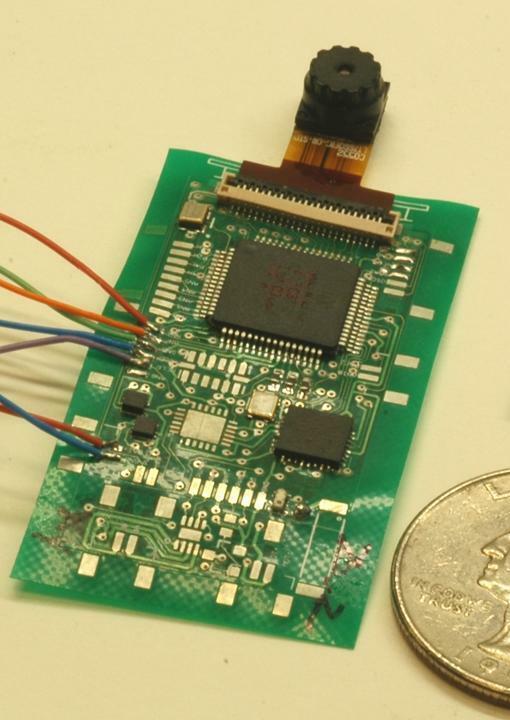 Board contains cell phone, gyro, accelerometer, 802.15.4 radio, and 2 channel motor driver in 1.4 grams. 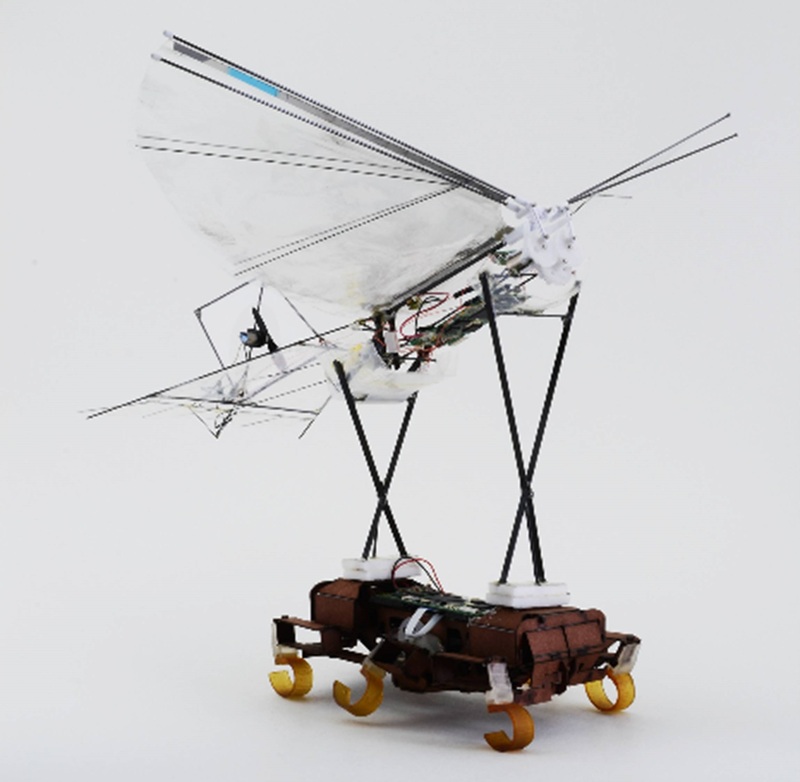 Commercially available iBird hover capable ornithopter equipped with ImageProc dsPIC33 CPU board. Total mass 12 grams. 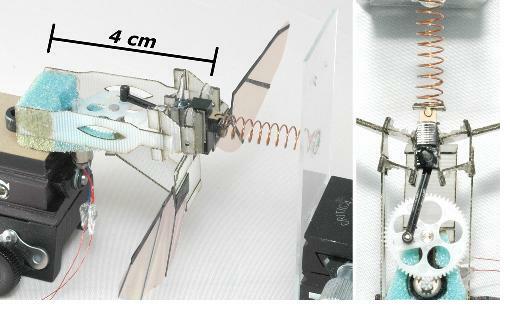 A model for a battery-driven DC motor driving a crank is developed, which shows in experiment a 30% reduction in required power when driven in resonance. Due to the pitching motion of flapping flight, optical flow has a large superimposed velocity component. This component can be sampled at the wing flapping frequency to recover the underlying signal. 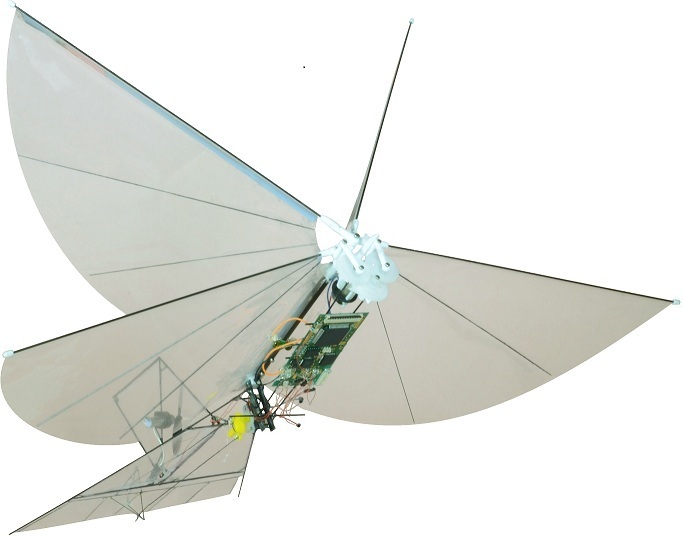 Commercially available VAMP ornithopter with custom low mass electronics. Total mass is approximately 13 grams, including Bluetooth and cell phone camera. 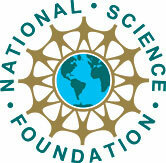 ``Flight Control for Target Seeking by 13 gram Ornithopter,'' IEEE Int. Conf. Intelligent Robots and Systems, IROS Sept. 2011. K.C. Peterson and R.S. 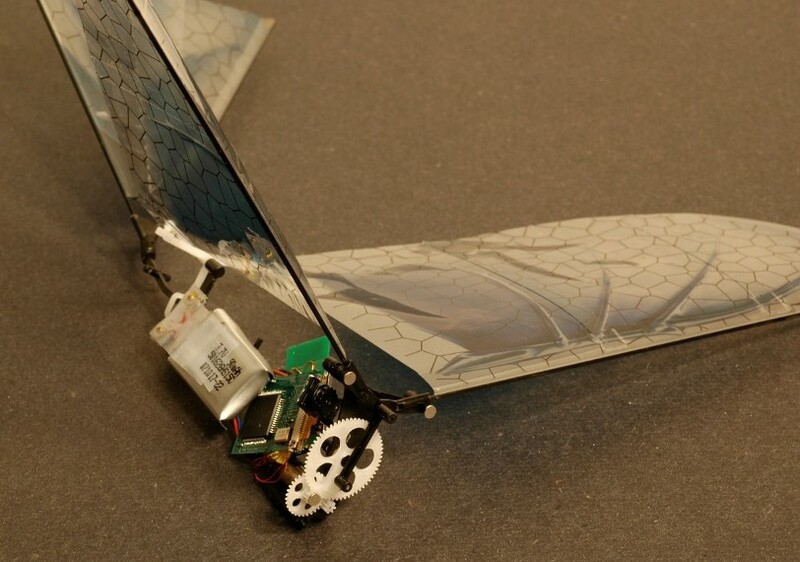 Fearing, ``Experimental Dynamics of Wing Assisted Running for a Bipedal Ornithopter,'' IEEE Int. Conf. Intelligent Robots and Systems, to appear Sept. 2011. ``Flight forces and altitude regulation of 12 gram i-Bird, IEEE BioRob, Sept. 2010. IEEE Int. Conf. Intelligent Robots and Systems, St. Louis, MO October 2009.